“...throw away the heavy textbooks and get set for some real-world wisdom from someone who has been there and done it...”—Mike McCurry, White House press secretary for President Clinton, principal, Public Strategies Washington, Inc. Forget leadership gimmicks and catch phrases, “instant” leadership manuals and Stalinesque approaches to bottom-line results. Skip the sharp cuts to cope with tough times, too. Real and effective leaders today—from the executive suite to the assembly line—quietly and consistently follow what Dr. Eich has identified as the eight essentials of effective leadership. True leaders know how to make ethical judgments in the face of real-world challenges, and recognize what it takes to win loyalty and respect, motivate through passion, develop positive relationships, and enhance open communication. 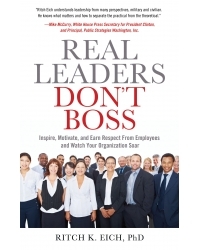 Real Leaders Don’t Boss is an easy-to-understand, practical guide to leadership in the workplace and in life that can help anyone grasp what it takes to inspire, motivate, and lead. With the help of real-life stories and advice from top leaders, it teaches how, with the right direction and guidance, real leaders quietly stand back and, no matter the economic conditions, observe as others achieve success, which creates their own successes. One of the leadership field’s preeminent experts, Dr. Ritch K. Eich has spent the last four decades studying the philosophies and fundamentals of true leaders. He’s been a top executive, a military communications specialist, a U.S. Joint Chiefs of Staff officer, a college teacher, a administrator, a consultant, a writer, and an entrepreneur. Along the way, he’s worked with or for a Who’s Who of world leaders, from Howard Holmes (Jiffy Mix) to Tom Monaghan (Domino’s Pizza founder) to Admiral William Thompson. He is founder and president of Eich Associated, a strategic branding, marketing, communication, and management coaching firm; an adjunct professor at California Lutheran University; a frequent speaker and blogger on leadership and marketing; and a columnist for various business and professional publications.